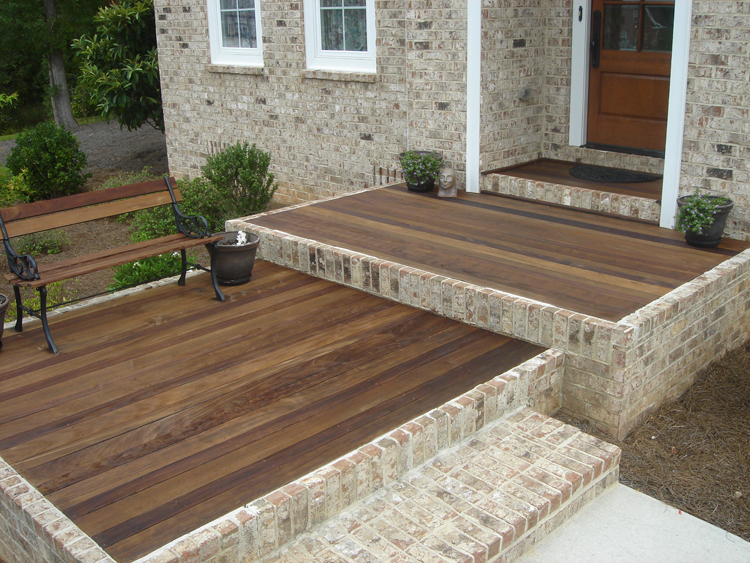 Are you thinking about a pressure-treated wood or a Brazilian hardwood deck? 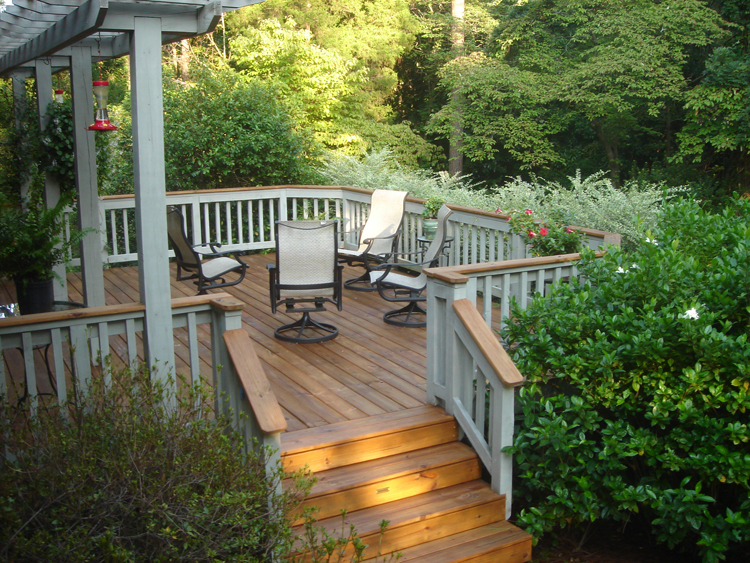 You have come to the correct place to read about options and considerations for your Central GA wood deck or porch. Here is some information to help you make your decision. With all the talk about low-maintenance decking options, you may feel like those are the only options. This can’t be farther from the truth. Wood is a great option for a couple key reasons. 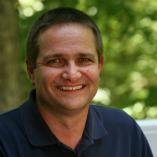 First, pressure-treated wood is a good bit more economical than low-maintenance composites. If you are considering a Brazilian hardwood such as Ipe or Garapa, unfortunately, those may be in the same general price range of using composite or PVC decking material. But just because wood is not in the low-maintenance category of composites, that doesn’t mean it is high maintenance. Your pressure treated wood deck will require maintenance once every year; but if this is done you will be able to walk barefoot on your deck without fear of splinters. Your ipe wood deck won’t have to be pressure washed, or sealed every year if you don’t mind the grayed out look of genuine wood. Ipe is so dense that it ages much slower than pressure treated pine and may only require maintenance every four or five years. Another reason wood is a great option is because of its authenticity. Nothing is more like real wood than the real thing – genuine wood. Whether pressure-treated pine, the heartier cypress or the very dense hardwood, there is nothing more authentic than the real thing. While synthetics and composites emulate the look of real wood with streaking, striations, and surface scraping, genuine wood comes about this naturally. Genuine wood is the material that others try to emulate. If you are selecting a material for porch flooring, you likely do not need a composite unless you are matching an adjoining deck. Wood takes the hardest beating from direct sunlight. If your deck is west or south facing and you have very little shade in that area of your yard, your deck will take quite a beating. But, if under the cover of a roof or if your deck otherwise doesn’t receive a tremendous amount of direct sunlight, your wood deck may require substantially less maintenance. Is all pressure-treated wood the same? No. There are different grades of pressure-treated pine and this seems more apparent in recent years. There are grades of pine that have more knots and that generally are not as strong as other higher grades of the same wood. Part of this can be attributed to trees coming from farms engineered for faster growth. With this accelerated rate of growth comes some loss of strength. Ask your builder about different grades of pressure-treated lumber. 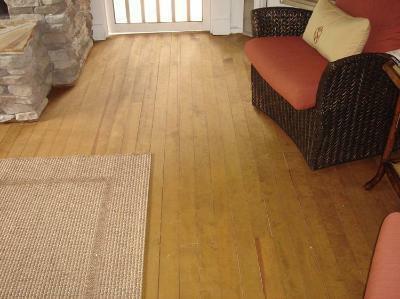 Exotic hardwoods such as Ipe, Garapa and Abaco are an excellent upper-end genuine wood option. These dense hardwoods naturally have tremendous variation in color from board to board but the boards themselves have beautiful striations. The wood itself is richly colored in a reddish, deep brown, or more of a golden shade depending on the type of wood. As noted above, exotic hardwoods come with a price tag that’s quite a bit higher and they will require maintenance in order to keep the deep rich color from graying out as all woods will do.